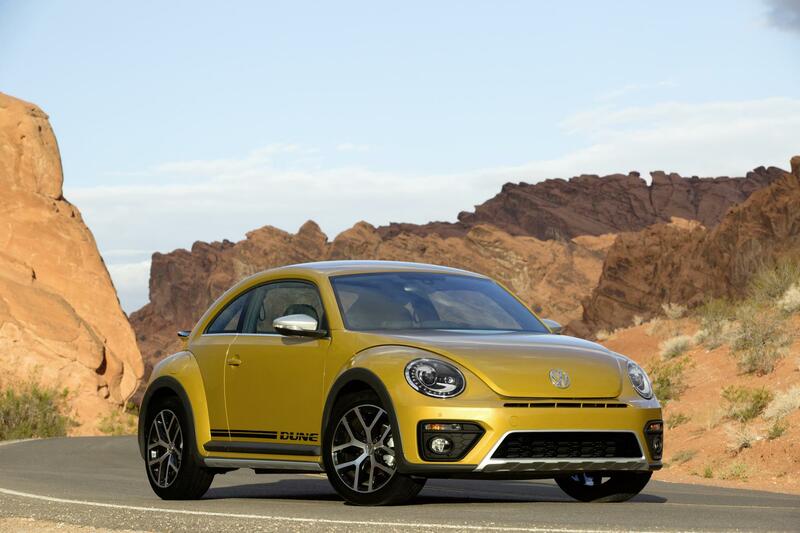 This is the VW Beetle Dune which has a rugged look thanks to its jacked-up the suspension and body kit and while it looks like a crossover, it’s not really designed for off-roading but does offer a great experience on-road. The ride height has been raised by 10mm and the aim is to offer a new futuristic dimension on the current VW Beetle range and looks very much the iconic Beetle beach buggy. 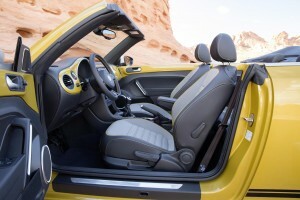 Owners will also find 18inch alloy wheels, wheel arch extensions, a silver framed air inlet, black honeycomb grille and a new bumper design along with a choice of cabriolet or coupe versions of the Beetle Dune – deliveries will start in June. In addition, there’s also a choice of five colours for the VW Beetle Dune with part of the dashboard and door panels matching the body’s exterior colour. There’s even a large rear spoiler and new LED lights to help create a fresh looking Beetle. The aim is to make the VW Beetle Dune stand out from the crowd and the designers have done just that. To help the vehicle’s popularity, it is also packed with equipment including a 6.5-inch touchscreen, Bluetooth connectivity, a dashboard-mounted CD player, eight speakers, SMS messaging and a media system. VW have also added auto-dimming rearview mirror, rain sensing wipers and parking sensors. Safety is also key and the VW Beetle Dune comes with electronic stability control, anti-lock braking as standard and there’s also rollover protection should owners take the car out onto a beach or over very rough terrain, for instance. Among the engines, there’s 1.2 litre petrol TSI unit which produces 105 PS with economy of 51 mpg and a 2.0 litre TDI unit which produces 150 PS and has economy of 63 mpg. The VW Beetle Dune first made its appearance as a concept car in 2014’s Detroit motor show and the production model is very similar to that car which raised eyebrows and gained a lot of attention. Available to order from 5 April, the VW Beetle Dune will cost from £21,300 OTR for the petrol engine version and £23,800 OTR for the diesel model. This entry was posted in Car Leasing, Cars, Family Car, New Cars and tagged VW Beetle Dune by Steve Lumley. Bookmark the permalink.